Lamar Odom made his first official public appearance since his hospitalization at Kanye West’s Yeezy Season 3 Fashion Week show on Thursday. He stayed quite close to Khloé Kardashian at the event at Madison Square Garden in New York City. This not only marks Odom’s first public appearance since he was found unconscious after an overdose, but also the first joint public appearance the married pair has made in years. Odom was escorted into the fashion show by West himself. The entire arena erupted into cheers when Odom walked in with West, according to Us Weekly. Kardashian reportedly sat by his side throughout the entire event, getting cozy with the former NBA star. They also posed for photos together. Odom appeared to be in good spirits during the show. He was spotted smiling and bobbing his head along to the debut of West’s album The Life of Pablo. Kim and Kourtney Kardashian, as well as Kris, Caitlyn, Kendall and Kylie Jenner, were also in attendance at the show. The entire squad came out to support West at his big event. West personally invited Odom to the fashion show, and doctors made sure he was all right to fly, but Khloé was the biggest influence in his decision to finally step out in public again, according to E! News. Odom appears to be well on the road to a full recovery after his hospitalization last year. He was found unconscious in a Nevada brothel in October 2015 after a drug overdose. Odom was hospitalized at Cedars-Sinai hospital for about three months before being transferred to a private facility near Khloé’s home on Jan. 6. 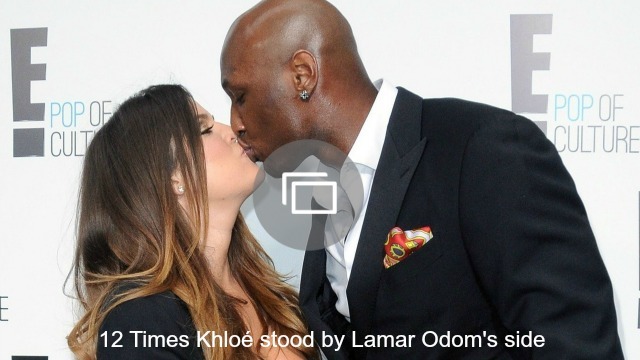 Less than a week ago, Odom went on a hike with Khloé and Kim on Sunday before the Super Bowl. Kim live-streamed the hike, and viewers reportedly could see Odom’s shadow in the video. Kim later posted an Instagram photo with the caption, “Super Soul Sunday time before Super Bowl Sunday time Khloé and Lamar.” An arm and a hand that appeared to be Lamar’s were also visible in the hiking trail pic.